I recently has some pepper jack cheese that I needed to use up. I had used some of it in quesadillas, but I decided to use the rest of it in an oven omelet for breakfast. Oven omelets are so easy. They are not exactly like a regular omelet, but they make a quick and easy breakfast and we love them. I usually use cheddar cheese in oven omelets, but the pepper jack cheese worked perfectly in this. Beat eggs and add remaining ingredients. Mix well. Pour into a greased 8×8 pan. Bake at 375 for 25 minutes or until done. You could also add some cooked bacon, or even sausage or ham to this. I love breakfast for supper… and this looks like something easy and quick! Thanks for sharing! Great idea. I like to add some veggies in my oven omelets. A brick of frozen spinach (defrosted) is a really quick way to add some vegetables to your eggs. Looks great! I think we’ll try that tomorrow morning! Thanks! My hubs loves pepper jack cheese, we will be trying this one! I love a good omelette!! Haven’t had pepper jack cheese in awhile…might need to grab some next time I’m at the store. Thanks for sharing! This looks good and very easy! Can you mix up the ingredients ahead of time (say the night before) and then just pour into the pan and bake later? That would be a great weekday morning option if so! @Meal Plan Mom (Brenda), I think that would work fine, you might just have to remix really quickly in the morning before placing in the pan to bake. I have made other oven omelet ahead of time and it works fine. I also often double oven omelets and we reheat them later in the week. This way I can cook two breakfasts at once. I made this for breakfast this past weekend. My husband and I loved it, it is very yummy. I added bacon but will add green pepper, and onion in next time that I make it. 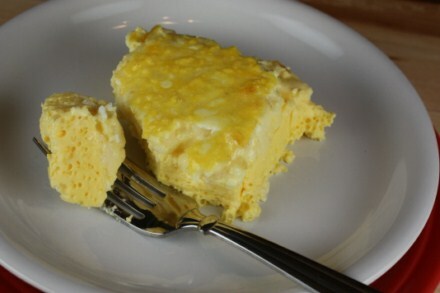 This recipe is one of the best egg bakes that I have tried. We will definitely be making this again! @Joy A., I am so glad that you liked it. I like the basic recipe because you could really change it up. Thank you for the great recipe – and the print option! My husband loves pepper jack cheese so this is sure to be a favorite at our house. Hi Lynn, thanks for sharing this recipe! I tried it tonight with chicken sausage, green peppers and cheddar cheese. It was very tasty but took a lot longer than 25 minutes to cook. I’m wondering if the recipe was supposed to say to bake for 45 min? Mine usually takes about 25 minutes, but that could vary depending on the size of pan you use. I am glad you enjoyed it! Thanks for responding! I’ll try a bigger pan next time 🙂 Definitely will try again… it was delicious!